UNTIL HE COMES IN GLORY! There is no understanding fully the feast of today without framing it in the context of what “sacramentality” is all about. Being the “sacrament of sacraments,” as St. Thomas puts it, and being both “the source and the summit of Christian life” (Vatican II), the Eucharist is eminently a “visible sign of invisible grace” (St. Augustine). In the very visible, and very ordinary reality of bread and wine, we see, and feel, and experience, in an extraordinary way, something that God meant to be so ordinary in our lives as believers – His living, loving, and gracious presence in the midst of His beloved people! Being a people such as we believers are, with one foot on earth, and one foot in heaven, living in these “in-between times” of the earthly existence of the Church, we could use a little reminder time and again, a “taste and foretaste” of what ultimately is ours by virtue of what Christ has done for us. This is what Eucharist is, and what Eucharist does, for us. 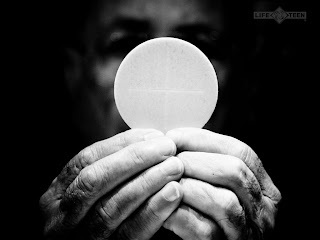 As the sacrament par excellence, it gives us this foretaste of what is to come in what the prophets foretold, in what St. Paul preached and taught, in what Jesus himself spoke about – “as often as you eat this bread and drink the cup, you proclaim the death of the Lord until He comes” (1 Cor 11:26). We are a people with such short memories. Distracted as we are by so much information, fed by a glut of sensual and psychological stimulations imaginable, emptied of the depth of noble dreams and visions by a culture of instant gratification and 24/7 entertainment monopolized by what passes for “reality-based,” but actually “voyeuristic” forms of infotainment, people nowadays, all over the world, have lost the ability to see beyond what meets the eye, to look and see far more than what their eyes can ever feast on – that is, we have lost that needed “sacramental stance” or that “sacramental view of reality” that brings us to a world of reality far deeper, far broader, far more significant than what appears to many. In the words of the poet Elizabeth Barrett Browning, “earth is crammed with heaven, and every common bush afire with God; but only he who sees takes off his shoes – the rest sit round and pluck blackberries” (Aurora Leigh). Only he who sees … Only she who “stops, looks, and listens” … to what? To what John the Baptist went out for, and cried out for: “Behold the Lamb of God, behold Him who takes away the sins of the world!” Only s/he who sees, knows, and only the one who knows, appreciates the real presence of Christ in his divinity and humanity in, and through the Eucharist! There is a whole lot we are missing, ever since postmodernism has thrown “mystery” and our appreciation for it out the window. Soon after the Boyszone band members crooned “No matter what they tell us … what I believe is true;” soon after hordes of both young and old have “declared independence” from any semblance of guidance from any “authority” figure like Holy Mother Church; soon after they have replaced the “sacrifice of the Mass” with what simply appears like the Protestant “communion service,” many of us consequently lost taste for the Eucharistic celebration, even as we have grown increasingly uninspired by insipid, and lack-luster, “feel-good” pep talks that the homily has degenerated into. When we ceased giving the “real presence” that “pious stare” that was due it, and the fitting humble adoration of it in the spirit of the Tantum Ergo, the Mass has become, in many places, just a celebration that offers people a superficial “fellow feeling,” in which the high point is the giving of the sign of peace. Once more this year, the liturgical calendar offers us an opportunity to re-appropriate what may have been missing, ignored, or glossed over in our common faith tradition as a people. Last week, we gave a serious look at the “story” of the Trinitarian God. We said that before it became a “mystery,” it was, first of all, “history” and reality. Today, we cast our glance at the ongoing and unfolding story of Jesus, gifted by the Father, who now “gifts” his body and blood to us in the form of bread and wine. Recipients of this sacrifice and self-offering, we now, in turn, led by no less than Christ the Victim himself, offer to the Father this same sacrificial offering. As victim, he shares his body and blood. As victim, he is the very lamb offered in a bloodless sacrifice, “for us men and for our salvation.” As priest, he himself leads us in the act of offering of this “sacrifice, which is now truly ours.” (Pray, brethren, that our sacrifice may be truly acceptable to God our almighty Father). But the Eucharist is not only about “here and now,” as we have seen above. If Eucharist is a pledge and a promise (pignus); if Eucharist is a “foretaste” of what is to come, no Eucharistic celebration can be complete if it does not go beyond mere horizontal fellowship and “fellow-feeling.” If it is fully Eucharistic, it necessarily has to be “forward-looking.” If it is to be Eucharist as Christ meant it to be, it has to be a sacrament of faith and love, and a sacrament of hope. If the celebration is genuinely Eucharistic, it is meant to “lift up our minds and our hearts,” even as “we give thanks to the Lord our God.” If it is truly Eucharistic, it ought to point to something deeper, something nobler, and something infinitely better than what our earthly eyes can set our sights on. This, the Lord himself alludes to in today’s gospel reading from Luke. The day was coming to an end. It was getting dark. The disciples and the enthusiastic crowds were “feeding on his every word,” as they listened avidly, unmindful of the fact that they brought no food or supplies with them. Nor were there Golden Arches anywhere near them to save the day for the same hungry crowds who definitely could use a “supersize” serving right then and there. But Jesus did not send them away running on empty. Jesus welcomed them. Jesus saw to it that they did not go away empty handed. I really want to be enlightened more on the post-modernism concept fads, namiss ko tuloy yung Homily and Goodnight talk po ninyo. thanks for reading my posts. i, too, miss everything and anything to do with those years ... and of course, everyone who made those years memorable. all the best!